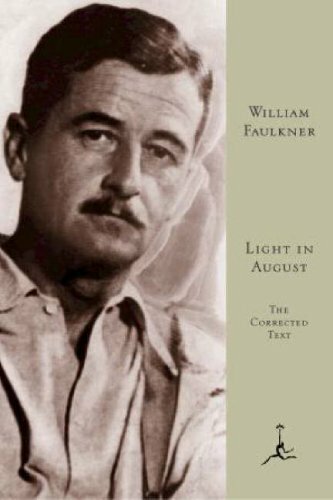 William Faulkner’s prose—stamped with his poetic lineage—shines. 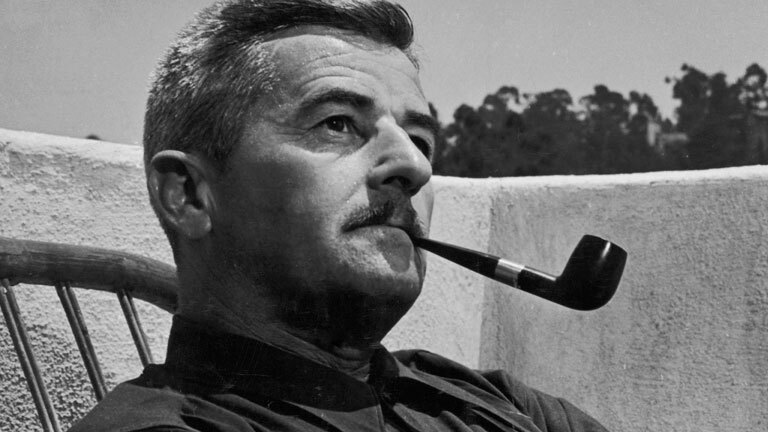 William Faulkner’s roots as a poet show. He adores words. His sentences shine as well in Light in August, sometimes referred to as his greatest novel. Sometimes it’s also called his most accessible great one, the last bead on his string of masterpieces between 1929 and 1932: Sartoris, The Sound and the Fury, As I Lay Dying, Sanctuary. I remember Light in August fondly from college. I wrote mostly poetry then, and realized only recently that I had based a character, in an epic poem I was slaving over at night, upon the novel’s immortal Lena Grove. Rereading it this summer, I’m struck by how sure a writer Faulkner was. His sentences thrill and inspire. Then again, there are enough of those Faulkneresque doozies to keep you on your toes. The story is simple. Lena Grove, poor and naïve, very pregnant but indomitable, a girl from nowhere Alabama, tracks her feckless beau to Mississippi. He works as a sawdust shoveler at a sawmill with a fellow named Joe Christmas, a bootlegger, soon-to-be murderer, and all-around tortured soul. Suffice it to say, troubles ensue. Nothing can look quite as lonely as a big man going along an empty street. Even a mare horse is a kind of man. Lying in the single blanket upon the loosely planked floor of the sagging and gloomy cavern acrid with the thin dust of departed hay and faintly ammoniac with that breathless desertion of old stables, he could see through the shutterless window in the eastern wall the primrose sky and the high, pale morning star full of summer. Two punctuation idiosyncrasies (which do have a logic): he uses nary an apostrophe in contractions, so can’t is cant; he runs together compound modifiers that normally would be hyphenated—though he’s inconsistent, neither correctly hyphenating nor oddly conjoining “back street restaurant,” and eventually he forgets the mannerism altogether. The house, the study, is dark behind him, and he is waiting for that instant when all light has failed out of the sky and it would be night save for that faint light which daygrainaried leaf and grass blade reluctant suspire, making still a little light on earth though night itself has come. Wow, but, well. Daygranaried leaf? I know what a leaf is and a granary—and day. So this is a leaf that drifted into a grain storage facility? The phrase’s brilliant, odd, specific gravity daygranaries the mind. I actually picture the yellow-mottled desiccated and warty leaf in an old whitewashed corncrib I knew. Then there’s “grass blade reluctant suspire.” Suspire means to sigh, or breathe. So a blade of grass sighed, albeit reluctantly.
. . . I can’t even. I recall how, when I was a kid, I used to call him “a purely rhetorical writer,” meaning he conjures with smoke and mirrors and clanking chains. Yet he feels his world so deeply that by dint of effort he wills it lopsidedly into being. I love and brood upon Dillard’s theories. For instance, there’s the irony of the “submissive” plain style being practiced by Faulkner’s macho rival, the personally overbearing Ernest Hemingway whose prose can be so window-pane clear and lovely. 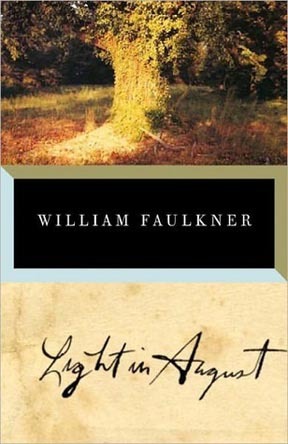 The more “dominating” fine style was employed by Faulkner, a reticent man. Though his style was showy, to me Faulkner seems to submit to and channel, prostrate before it, the South’s tragic history and its rotten-at-the-core lost dreams of grandeur. Maybe his artistic submission to his region gave him the courage to conjure and dominate it in prose. I too read Light in August in college. Alas, I didn’t read with a fraction of your perception and nuance. I probably would enjoy the book again, especially after reading this post. Plain style has won, Shirley! Dillard herself perfected it in The Maytrees . . . Thanks, Richard. I’ve been meaning to revisit Faulkner, who poleaxed me way back when with As I lay Dying and Sound and Fury. He’s the only author I found as enchanting and otherworldly as Joyce. I haven’t, in fact, read Light in August and as the month approacheth, I will. You’ve got some pleasure ahead, dclaud. Hi, Richard. 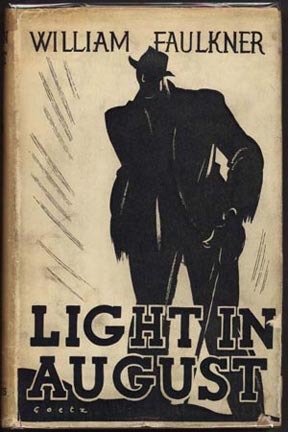 Though I think you are correct in assuming that “Light in August” is a masterpiece, it can be a devil of a work to teach, particularly given Joe Christmas’s end as a sort of ironic Christ-figure sacrificial victim. Victim, because he starts out life as a victim and life gives him nothing much to expect. Ironic because he still has an existential choice, and makes the murderous wrong choice, for a complicated and understandable reason, or at least it’s possible to comprehend his motivation. For people who want their Christ symbols plain and simple, I don’t think the book is satisfactory. I enjoyed it, but religion has never been a simple matter for me. I agree, Victoria, that it’s a problematic one to teach. For me, I rule it out as I imagine teaching it to a diverse class. I sense that students of color, a tiny minority where I teach, would be made very uncomfortable. The irony, I realize, is that the novel is about racism. But Joe Christmas is so tortured by his mixed-race heritage, that aspect has become largely anachronistic and of historical interest. That’s perhaps an interesting discussion point, except Faulkner renders everyting in such searingly personal ways. Some of Christmas’s self-prejudice, and the way he has internalized the south’s, can be hard to take even as it is rendered into art. I love Light in August and would defend anyone’s right to teach it, but as for me, I’d pass in favor of something else that deals with the effects of racism. Added to my list. I’ve never loved Faulkner’s themes or style, but I haven’t read this one — and honestly, I haven’t read Faulkner since college, when I was a different person who held fervent, idiosyncratic biases. Daygranaried got me, because of vivid memories of daylight pouring throughout the chinks of my grandparents’ granary, illuminating the dust motes. Pure poetry–I got it without understanding it. Plain hasn’t won for me. I’m a mom without a favorite child (or with 2 children, both of whom are favorites). I believe that both literary offspring get to have their say. Take turns, please. I like your image of daygranaried, Tracy!